Description: Colonies consist of large numbers of small transparent zooids connected by basal stolons. The branchial sac, orange-brown stomach and chains of grey faecal pellets can all be seen inside the zooid when it is alive. 5mm x 4mm x 2mm. Habitat: Found in sheltered places from lower shore to 30m growing on a variety of substrata, especially on hydroids and bryozoans, even on crabs such as Hyas araneus. Distribution: West coasts of the British Isles south to the Mediterranean. 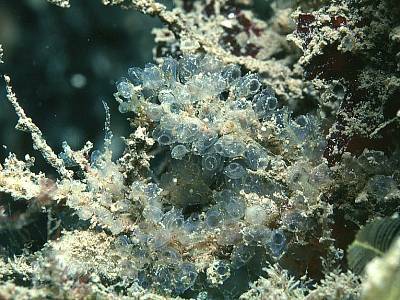 Similar Species: There is no other common small ascidian in the British Isles with separate zooids connected by a stolon. See also Protostyela heterobranchia - description in Millar. Small separate zooids connected by stolon. Picton, B.E. & Morrow, C.C. (2016). Perophora listeri Forbes, 1848. [In] Encyclopedia of Marine Life of Britain and Ireland.